Keep a copy of the most spectacular photos and most captivating videos from your adventures with the Sharper Image 1080p Action Camera. The Action Camera from Sharper Image lets you take home and look back on every memory youve made and adventures youve been through. Working with a full high-definition 1080p camera, it lets you capture the most spectacular and remarkable photos and videos, making it more satisfying to think back of the best moments youve had. With a digital zoom of up to 4x, it lets you capture the clearest photos even at a far distance. This makes it an ideal gadget to those who love going on heights and exploring the vastness of the surroundings. Furthermore, the Sharper Image Camera is equipped with a bike mount, a helmet mount clip, and base with a strip, and a waterproof case which makes it perfect for your varying endeavors. Other than this, it comes with a built-in microphone to record the sound in real time in time with your videos. It also comes with the car mode features which makes it easy for you to take photos in sequence. Additionally, it has a micro SD slot which enables you to extend its storage and make room for more photos and videos. It also comes in a stunning color of blue. 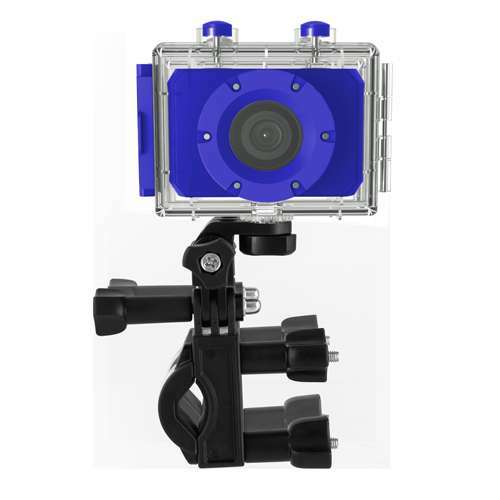 Purchase the Blue Sharper Image 1080p Action Camera today only here at TigerDirect! Sharper Image logos are registered trademarks of Sharper Image. All others trademarks and copyrights mentioned herein are the property of their respective owners.